In the physical world, when you want to create or modify something, you use tools. Carpenters use saws, hammers, screws and nails. Surgeons use scalpels, stethoscopes, x-rays and stitches. Chefs use knives, saute pans, graters and spatulas. As an energetic healer or energy medicine practitioner, the tools we employ are our intentions, imagination and visualizations. With that said, healing through the use of energy medicine and other energetic healing techniques happens when the movement of subtle energy is restored to the affected parts of the energy field. Healing charges the subtle self with “positive energy”. It raises the vibratory level of the energy field in and around the physical body where negative thoughts and emotions have attached. This causes the “negative” energy to break apart and fall away. Said in another way, healing via energy medicine straightens, strengthens and heals energy pathways thus allowing our life force to flow again. This supports increased health and healing to the body. It is often experienced as a sense of deep relaxation and feelings of peace, security and well-being. There are hundreds of techniques that can be used to positively affect the body’s energetic systems. Rituals, for example, create an atmosphere which works to accentuate one’s intent and intentions. Meditation, Reiki, guided imagery and techniques such as psychic surgery also require one to focus their intention on the subject of their work in order to be truly effective. The tradition of burning sage or sweet grass is used in Native American cultures to clear unwanted or negative energies. It is believed this ritual will clear and dissipate discordant energy, which is carried out on the uprising smoke. Some may think the burning of sage is what clears the energy. This is a misnomer. What is important is the belief, the intention of the energy being cleared. Without it, nothing will happen at all. There is a big difference between going through the motions and actually using your intention when working with energy medicine. 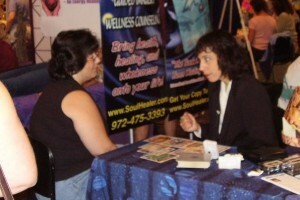 A few years back, I was performing medical intuition evaluations at a holistic/new age fair. A few rows from where I worked was an energy medicine practitioner doing energy work. As part of his healing sessions, he would point a crystal towards the seventh chakra of his clients. The crystal he used was very impressive. It was long and clear and nicely tapered. It was mounted in a wand, which he held between the palms of his hands. Throughout the day, I would periodically look up and see him working. On many of these occasions, he would be sitting at the head of his client, wand in hand. But instead of having his energy and intention focused on his client, he would be looking around the room, watching people as they walked down the crowded aisles or checking his watch. How much healing was actually happening is anybody’s guess. The truth is anyone can do energy work which can provide a healing affect on the recipient. When I was a child, if I hurt myself, my Mom would say this Spanish prayer sona sona – oy sinthisona, sona sona manana and then kiss my owie. Miraculously, it would stop hurting and I could go back to what I was doing. Lynne McTaggart & other new thought authors state that intention is the primary part of healing and underlies the effectiveness of energy medicine. In one study with HIV patients, it was found that regardless of the type of therapy or energy work being performed, shamanistic, reiki, quatum touch, the researchers discovered that it wasn’t the modality that made the difference, it was instead the level of focus and intention that the practitioner used when performing the work. Many are also familiar with the work of Larry Dorsey where he discusses the healing power of prayer or have heard stories of miraculous healing that have occurred when prayer was introduced into a wellness program. Like all energy work, prayer has power, especially if intention is applied. If one is saying a bunch of Our Fathers and Hail Mary’s with no intention, then probably nothing will happen…but if intention is applied, then changes can and often do occur. The same holds true for working with affirmations. You can say them until the cow comes home, over and over again, but if your intention, which includes your ability to see or feel desired changes isn’t part of it, then nothing will happen..
With any kind of healing work, each party has their own particular role to play. The job of the healer, is to help get your client’s life force energy flowing again. This is achieved by breaking up energetic blockages, dispersing stagnant energy and supporting the movement of energy in the body. As a energy healing practitioner, please remember two things. 1) Healing energy flows through you, but it ultimately come from God, the Universe or from some power far beyond us. So please do not take credit or allow your ego to jump into the middle of the whole process. 2) You can only assist in restoring health and balance to someone’s life force energy. Your client must also be part of this process. So let’s talk about just that, the role of the client or the object of our healing energy. For healing to occur, our clients must also be willing participants – willing to accept the healing energy being given to them. They must also be willing, on an unconscious level to let go of negative thoughts and emotions, which have manifested as stagnant energy in their system. Tied to this, it is also important for you and your clients to recognize that sometimes the healing doesn’t come in the way, shape or form they think it should. So instead of getting frustrated that a symptom or discomfort hasn’t been eliminated right away, have them take a step back and look at changes that may be occurring in the totality of their lives. It is often through these changes that true healing begins. Tagged disease, energy, energy healing, energy medicine, healing, health, holistic health, illness, medical intuition, subtle energy.